With just the right balance of chocolate chips and cookie dough, Maryland cookies are some of the tastiest, bite sized cookies on the market. 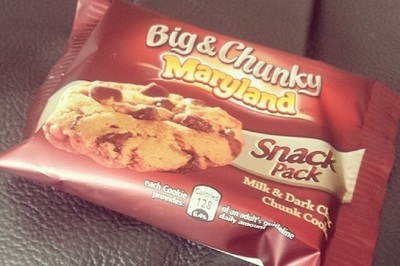 Over the past couple of years, however, they've upped their game and released Big & Chunky cookies. As the name suggests, these cookies are big and they are certainly chunky. They don't have the same quality as a home-baked, chewy cookie, but they're the perfect accompaniment to a cup of tea, coffee, or hot beverage because they have a great dunk-able quality. If you want thick, chunky cookies then these are the ones. I bought these in Sainsbury’s, but you can find them in Asda, Morrisons, Tesco, Waitrose and Marks & Spencer. They’re a firm favourite in our house and when I visited home over the weekend, it was a joy to share a pack between my sisters, as we sipped on cups of tea and watched a film. I think it’s a stretch to say cookies unite a family, but with these thick, yet share-able beauties, that seems to be the case.